Let me tell you a little story about how I fly and the internal conflict that ensues. If y’all have spent any time following my blog or Twitter, you know that I seem to wind up on airplanes a lot. Last year, I logged 75,000 miles, with my longest flight lasting 12 hours. It may come as a surprise to you, then, that I am not a good flyer. In fact, I’ve resorted to many possible solutions for my flight anxiety, from hypnotherapy to whiskey. (Both happen to work, but the latter makes for a rather groggy arrival, just FYI.) But here’s the thing. Even though flying ramps up my anxiety, it’s boring to an outside observer because there’s no external conflict. This person could be screaming her brains out on the inside, but to an outside observer she’s still just passive and static. These days, the only real problem I have with flying is takeoff. Landing is fine, being in the air is fine, but takeoff always gets me. (In the air, you don’t really realize you’re going 500 mph because you don’t have the ground as a reference point. On takeoff, you can see exactly how fast you’re going and you can feel yourself pulling against gravity, and I think that’s what bothers me. It’s a physical reminder of the forces involved and I don’t like to think about it.) Turbulence used to really bother me until someone I sat next to once said, “Imagine a stick bobbing in a river. It’s not comfortable, but it’s safe because it’s behind held up by water. Water has mass, and so does air. We’re floating on top of a choppy current, but we’re being held up by the air in much the same way.” That really helped. Until I got my head straight re: turbulence, though, I would sit in my seat, pinned down with my own internal conflict, operating under the mistaken notion that my constant vigilance was the only thing keeping the plane in the air. I wanted to note every noise, feel every g-force, monitor every bank, and otherwise white-knuckle it until landing. 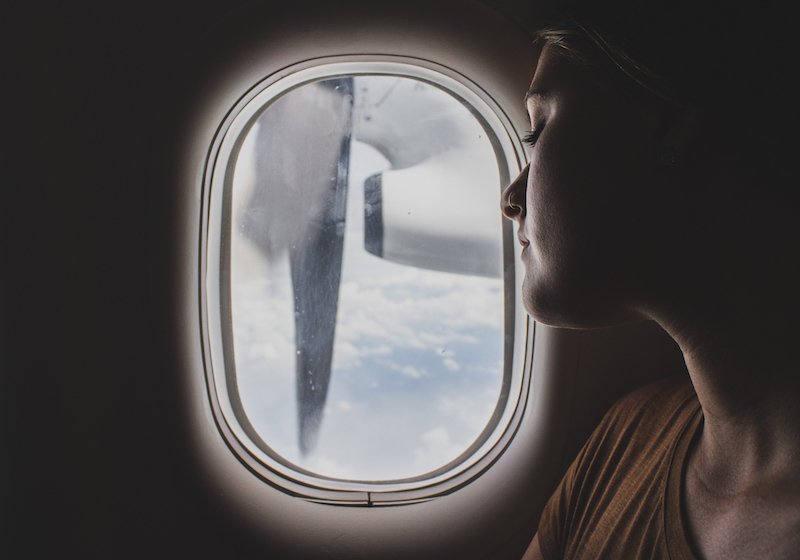 Flying is completely out of a passenger’s control, and through the sheer force of my anxiety, I flew for years in a state of hyper-vigilance, hoping to regain some of that lost agency. If I were to give you my Interiority on a plane–my thoughts, feelings, emotions–there would be a lot going on. Every second would be consumed with my brain’s whirrings. Worry is a very familiar, specific, and active thought process. (And here I arrive at how all this applies to writing…) There are lots of novels where I read characters worrying, and it’s a very natural emotion that helps raise stakes and build tension in story. In fact, I think that a lot of characters don’t worry enough, and a lot of writers miss great opportunities by not sharing their protagonist’s anxieties with the reader. But there’s also a danger in writing a character who is constantly worrying. Think back to me in my window seat, monitoring every aspect of the flight and gripping my armrests. Internally, I am a hive of activity. But, to the observer in the seat next to me, I look like I’m…just sitting there. There’s no external conflict. Worry is great in doses, but you can’t build a plot on internal conflict. Because it’s static. I happen to find my thoughts as I fly fascinating. But Mary Flying would make a terrible movie because it is physically passive and static. So use internal conflict to amp up tension and raise stakes and definitely include it as Interiority. But remember that you need to balance it well with external conflict, or you risk your character…just sitting there. At one point, they have to cross the thought/action barrier and do something about all of their anxieties. They need to be proactive and to make something happen in the world of your book. We learn a lot about character through Interiority, but I’d argue that we learn more as they actually get out of their heads and take action. (There’s also the juicy tension of them thinking one thing and doing another, for example. But, again, you can only get there once you put them in motion.) As for me? You’ll often find me 30,000 feet above your heads, but these days, I’m more often than not (thankfully) asleep. Hire my editing services and I’ll help you balance the internal and external conflict in your story. How the hell did you sneak whiskey on board a plane? They never let me take bottles of anything on board. /completely missing the point. Good point about use of worry in a story. I’m sorry take off is so uncomfortable for you…I’m not fond of plane rides either. I used to feel the exact same way about flying. I refused to go to sleep because I wanted to remain hyper-aware of everything that was happening on or to the plane. But then I started ordering wine and it’s gotten much better ever since. In-flight drinks make all the difference. I also freak out every time a plane takes off. @Gwen: airport bars are a great place. Check in early, hit the bar, get on the plane. Or juice up in the terminal pre-pat down/scan. Great point about interiority vs action – will put that to use in my current MS. This is why they make Xanex. lol I’ve worked for an airline for 15 years and I still hate some things about flying…mostly the turbulence. I was on a flight to Europe once that bounced across the entire Atlantic. I didn’t sleep a wink…even in first class. Which is why I always make sure I have something to ease the anxiety just in case something similar occurs. Or it could be that we’re stuck on the runway for 3 hours for bad weather. Yep that’s just as bad. You’d be surprised to learn how many people really do hate flying. I talk to them all the time. Now that you mention all this, I wonder if my MC has worried enough….. must go check …. I had this image in my head of you hiding a bottle of whiskey in an inside coat pocket and sneaking sips when the flight attendants weren’t looking. The passengers nod approvingly and ask for sips. Pretty soon the whole cabin is buzzed.